(Photo courtesy Utah Fire Info) A crew battles the Tervels fire about 6.5 miles northeast of Coalville. 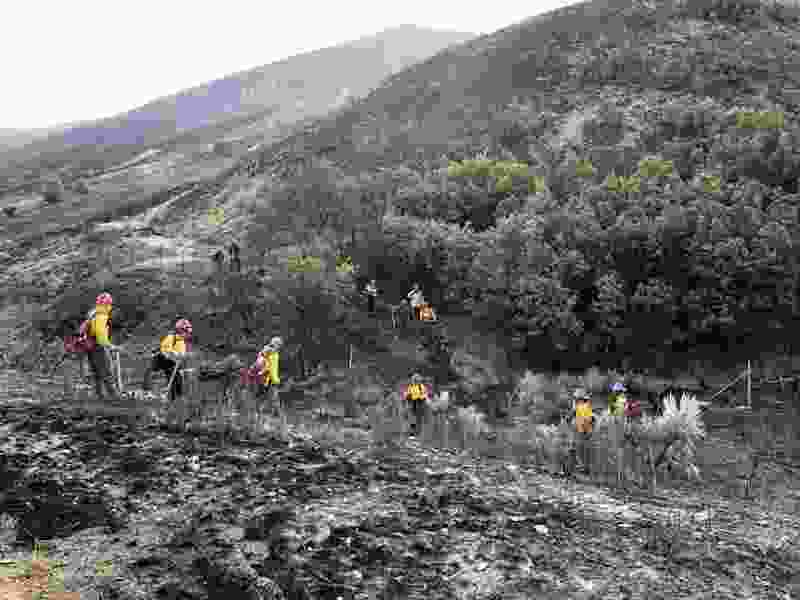 The Tervels fire northeast of Coalville — the largest of 13 related arson fires in Utah and Wyoming — has been secured on its north and south flanks as of Thursday and is nearly contained. A warning of possible evacuations in the Echo Creek Ranches area has been lifted, and the closure of one eastbound lane on I-80 between mile markers 169 and 171 has been lifted Thursday, according to fire officials. The fire, believed to have been caused when someone threw something flammable from a car traveling on I-80, was 95 percent contained Thursday evening. No structures were threatened. It has burned more than 530 acres. A series of 13 fires were set along I-80 on Monday afternoon, beginning in Tooele County and continuing into Wyoming. Authorities are looking for suspects. Anyone with information should contact the Summit County Sheriff’s Department at 435-615-3500.